Jane Oates moderated a panel with Elise Stribos, Jeanie Wade and Ryan Craig. 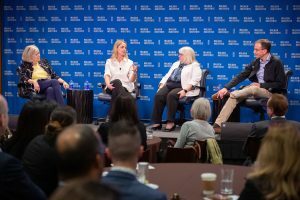 On November 16th, the LAEDC was excited to take part in “The Future of Work in California Townhall” featuring experts from the academic, industry and nonprofit sectors hosted at the Milken Institute‘s headquarters in Santa Monica, CA. In an era when technology is advancing so rapidly, it was an unique opportunity for the LAEDC to partner with with WorkingNation to lead a series of engaging panel discussions which took aim at some of the most challenging issues facing our future workforce, both from the employers’ perspective and the talent development perspective. 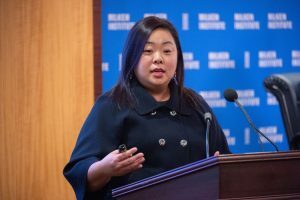 LAEDC’s Director of Workforce Development, Jessica Ku Kim presented thoughts on how the LA basin is responding to the future of work, and announced the launch of a free internship program for business created with the Center for Competitive Workforce (CCW). “Especially for this generation that is investing so heavily in their education, we want to ensure these talented students are entering the workforce with the opportunities and skills they need,” said Kim during the program’s opening remarks. Click here to learn more about the CCW and how to initiate a free internship program for your business. Kevin Klowden, Eloy Ortiz Oakley, Soraya Coley, and Jay Banfield. 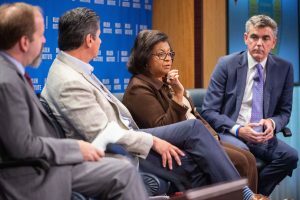 Employers took the opportunity to connect with educators and other talent development organizations in a summit style atmosphere, which helped foster an environment for change and innovation. Participants left with a better understanding of what different industries are prioritizing from a hiring perspective, and also how businesses can take charge of training and pioneer best-practices for talent development. There was also significant discussion about the changing skills requirements, talent gaps that employers are facing, and some of the new industry-education partnerships that are driving changes in curriculum and coursework to give students specific skills that align with hiring needs of business. Center for a Competitive Workforce is also leading these regional collaborations between businesses and the 19 community colleges of the LA|OC Regional Consortium of colleges. Read more in Forbes’ recap: “Business Should be Leaders in Training Workers” by Ramona Schindelheim of WorkingNation. Special thanks to Kevin Klowden, Executive Director of Milken’s Center for Regional Economics and California Center, Elise Stribos, Head of Human Resources and Talent with EVELOZCITY, Jeanie Wade, Head of Human Resources of Northrop Grumman, Ryan Craig, Managing Director of University Ventures, Soraya M. Coley, President of Cal Poly Pomona, Eloy Ortiz Oakley, Chancellor of the California Community Colleges; and Jay Banfield, Chief Officer of Innovation & Scale at Year Up.